Been daydreaming about getting away on the weekends? Hoping to bike, fish, and relax. 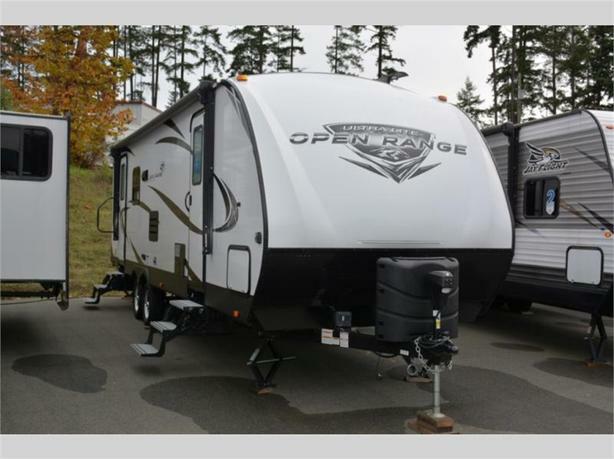 This Open Range Ultra Lite UT2710RL travel trailer can be the answer to your dreams. You can sneak out the main entry while your spouse stays in bed thanks to the two entry doors. She might even sneak out the bedroom entry while you are putting on your shoes to beat you to the fishing hole. After she catches more fish, you can return to make breakfast with the stainless steel appliances, or relax on one of the two recliners or in the theater seats while watching the 39" LED TV. Come see how this is the perfect couple's travel trailer with extra sleeping space for overnight guests! With any Highland Ridge Open Range Ultra Lite model you will appreciate the ease of towing, and the spacious living area. The weather conditions will not matter with the mandatory Thermal package which includes a heated and enclosed underbelly, ducted heat to underbelly with cold air return, enclosed cable operated gate valves, and R38 reflective foil insulation in the floor and roof. Inside you will enjoy the skylight in the kitchen and bathroom, the queen size convertible bed with extension, and linoleum flooring. It's time to enjoy nature in comfort, choose your favorite model today!